The polling firm Ibope released on Wednesday night a new voting intention survey conducted with 3,010 voters in 209 cities across Brazil, commissioned by O Estado de S. Paulo newspaper and Globo TV Network. The pollster will disclose opinion polls every day until next Sunday, Oct. 7, when Brazilians will vote for president, governor, Congress, and state legislature. A runoff vote may take place on Oct. 28 if no presidential and gubernatorial candidates win a majority in the first round. The poll shows far-right presidential candidate Jair Bolsonaro at 32 percent of voting intention. 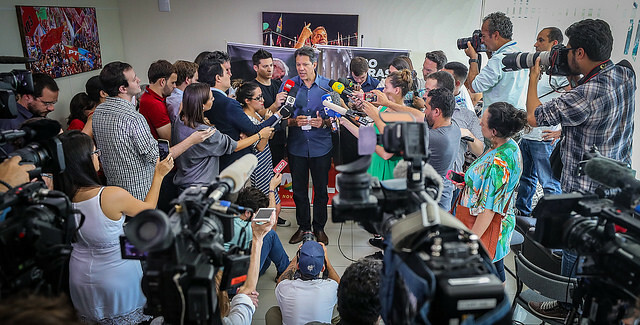 Left-wing Fernando Haddad is second at 23 percent and would go into the runoff with the Social Liberal Party rival should the election take place today. The poll also shows centrist Ciro Gomes at 10 percent, right-wing Geraldo Alckmin at 7 percent, and center-right Marina Silva at 4 percent. Ibope shows the two candidates in the lead in a technical tie in a runoff vote: Haddad is now at 43 percent of voter support, while Bolsonaro is at 41 percent. The two presidential hopefuls also have the highest rejection rates among candidates: 42 percent of responders told Ibope they would not vote for Bolsonaro under any circumstances, while 37 percent said the same about Haddad. The margin of error is plus or minus 2.2 percentage points.